V.com weekend vote: Should string sections have rotating or fixed seating? February 1, 2019, 2:17 PM · Earlier this week our blog about playing second violin got me thinking about the system of seating in various orchestras, and the pros and cons of having rotating vs. fixed seats. Certainly, we established that there are problems with an orchestral seating system that ranks its players first-to-last, with the idea that the "best" are in front and "worst" in back. It's a system that shape attitudes in ways that are competitive and back-stabbing, rather than supportive and cooperative. It also doesn't necessarily provide balance or lend strength to the section. One possible solution, which readers mentioned and a good number of orchestras already do, is to have rotating chairs, that is, to seat everyone one way for one concert, and then have them move to different chairs for the next concert. The rotating can be individual, or it could be by the stand. Generally, the section leader remains a fixed position in this scenario (does anyone know of any experiments that have rotated the principals as well? I'd be curious!) Rotating has the benefit of putting people in different physical parts of the section, having them gain perspective and experience for being near or far away from the conductor, being closer or less close to the audience, for being in the middle of the orchestra or on the periphery, etc. I actually don't know of any orchestras that rotate between first and second violins, but I'd also be curious about whether that appeals to anyone and whether it has worked in real life. Also, I think there are still possibilities for a fixed seating situation that is equitable and does not cause distress and unhappiness. 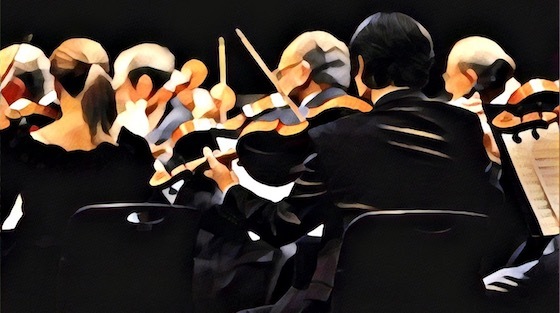 People don't necessarily need to be moving around the orchestra in order to be seated in a balanced, helpful, collegial way. I'm imagining a situation where the section leader and/or conductor devise a fixed seating system each season (or academic year, or semester) that simply puts various kinds of strength throughout the section. Also, it makes sense to put compatible personalities together - or separate particularly explosive personalities -- and keep them that way! What are your thoughts? Does it make more sense to have a rotating seating system, or fixed? What is your experience with either type of arrangement? What are the pitfalls and benefits? I'd love for us to share experiences and then bring our best ideas to our orchestral leaders! February 1, 2019 at 08:22 PM · In my experience, rotated seating is better except in the case of principal second and concertmaster. Those two should be the most skilled and responsible violinists in the section. February 1, 2019 at 09:15 PM · Our community orchestra has appointed principals who then assign parts on a rotating basis. Our members enjoy it. They get to know more members and everyone learns more by sitting next to someone different each concert. February 1, 2019 at 09:20 PM · I am strongly in favour of rotating sections, especially in the violins so players can get more varied experiences in orchestras e.g rotating players between the first and second violin sections. One system I have heard of is that violins are split into two groups and that group A will play first violin for some pieces and second for others and same with group B. The concertmaster is a fixed position. I also think rotating section leaders would be a cool idea, especially for non-pro orchestras, but I think it is best to rotate between a few of the stronger players. Principal positions in pro orchestras should stay as fixed positions for reasons of artistic leadership. I think being in the back of a section should not be an indication that one is weak. I think it is important to mix everyone up. I even venture to say that people who play both violin and viola should rotate between the violin and viola sections. February 1, 2019 at 09:36 PM · I, too, like the idea of rotating seating, with the exception of the first one or two stands in the section. Just as it's important to understand the differences of playing in both the front and back, I think the inside/outside seating aspect is also important. Those pages don't just turn themselves! February 1, 2019 at 09:41 PM · I like rotating seating. A number of major orchestras, CSO among them, use this system. As I recall, the CSO's training school, which I played in a couple of seasons while I was in school, follows this plan, too. But I don't believe the parent orchestra or the training school rotates between 1sts and 2nds. I was among the youngest members when I joined. I had comparatively little orchestra experience, except for high school, and started in 2nds, mid-section; but then I got "drafted" for 1sts a few weeks in. This would happen now and then -- as vacancies occurred when players landed outside jobs or moved on for other reasons. It must be hard enough to pick a concertmaster or principal 2nd on the basis of skill, leadership ability, and previous experience; but trying to rank players for a whole section, seats 1-16, on the basis of overall ability must be a lot harder. February 1, 2019 at 09:44 PM · Although I voted for fixed, I think the concert master and assistant concert master should have established seating and others rotating would be beneficial. February 1, 2019 at 09:47 PM · Obviously principals should be at the front, but rotating seating makes sense for tutti players. They all took the audition, won the same job, and get paid the same amount (well, in my country anyway). Also, it's near impossible to rank 16 players from 'best to worst'! February 1, 2019 at 09:51 PM · When I saw the question the first thought that came into my mind was a swivel chair, such as you find in offices. Then I had a second think. February 1, 2019 at 10:47 PM · I was thinking of the Space Needle, which has a rotating restaurant. So if it involves restaurants, count me in. This is one of those "no-win" topics where half will insist on one way and half on the other. It can work out well or not. It just depends on the situation. For example, let's say you have a great stand partner: you get along great. Both the same height. You both like the same fingerings. The other person likes your snide comments about the conductor. Et cetera. But if you start rotating, maybe your next stand partner is too tall, insists on writing in every single gem of a comment from the conductor, plus the usual assortment of eyeglasses, stars in the margin, and exclamation points. They wear too much cologne, rush, and never have a pencil. So do you want to rotate into that stand? So rotation can work either for you (and the orchestra)....or not. Personally, I have rotated into a stand with a psychotic player. It's not fun. In most decent orchestras, there shouldn't (theoretically) be a big difference between the best and worst players. As long as everyone can see, has room to play, can hear themselves, and the bowings and dumb concertmaster comments get passed back, the orchestra should sound just as good. However, there is one situation in which I believe that rotation is simply the fair thing to do: When players in the back are close to the percussion or woodwinds, as they are on small stages. Other than that, it's a toss-up. People will generally adapt to whatever the situation is. February 1, 2019 at 11:29 PM · I like rotating seating. In both of the orchestras I currently play in, there really isn't an orchestra-wide string seating policy other than to leave it to the section leaders. In one, a high-level orchestra where everyone is a strong player, the usual practice seems to be to have a core group of 2-3 stands at the front of each section, and rotate everyone else, including rotating violinists between 1st and 2nd violin sections. It's still somewhat hierarchical, but unlike many community orchestras, the split isn't 1st violins -- 2nd violins, but rather, titled players -- core section players -- rotating players. Maybe this has merit: in a top-tier community orchestra it probably isn't that difficult to pick out the group of players whose ability is at or near professional level, but it's extremely hard to rank all the players individually. In the other orchestra, a mid-level orchestra with a much greater disparity between the best and worst players, the string sections seem to use ranked seating. I'm principal violist, so in theory can use a different system, but there are only four of us in the section. I'm seating the next-best violist up front with me, and after that there's only one other stand! If I had 4 or more stands, I'd rotate by stand; if I had 3 stands, I'd probably put the weakest players on the second stand so that they're surrounded by stronger players and so I can hear them more easily in rehearsals. February 1, 2019 at 11:38 PM · I think the principals should rotate too. It has always infuriated me to some degree that it never seems to really happen, except for the few cases where there is a principal pool with a few people in each string section. In the case of non-professionals, everyone can learn some leadership skills. The only way you can learn to lead is to lead. I think that there is sometimes too much fear of failiure on the part of conductors of non-professionals. It isn’t brain surgery. In the case of professional groups, your sections shouldn’t have such massive skill discrepancies between players that a catastrophe would happen if different players led. And I am also all for first and seconds rotating, and maybe even viola. February 1, 2019 at 11:55 PM · The thing about being a principal, though, is that you must put aside a good deal more time to do all the bowings in advance, coordinate those bowings with other sections, and then truly take responsibility during the rehearsal to lead (meaning knowing every note and where it goes) and also to communicate every change, and there is always quite a lot to communicate. So while it requires a high level of playing skills and awareness of style and genre, it also really goes beyond those playing skills into organizational and communication skills. February 2, 2019 at 12:00 AM · I don't know how to vote here. My experience has been with fixed seating, fixed that is for half a year. After that there were people leaving and others joining and the cards would be mixed again. So fixed for a "season" and then rotating out of necessity. I do think though that one gets used to a stand partner and that that will make life easier than frequent change. Also: If you rotate, how often? February 2, 2019 at 12:02 AM · On that other column I suggested that one rotation could be Assistant Concertmaster & Principal 2nd Violin trading off. For a less than professional orchestra, I would put the four or five most accurate 1st violins on the outside row closest to the audience. For a less than excellent orchestra there could be three groups of violins, one group you would want to stay in the 2nd section, one group always on first, and a middle group that could rotate between 1st and 2nd. For an Opera orchestra with a heavy schedule (Vienna, Met., etc.) I think you would want to have several concertmasters that would each concentrate on leading one show at a time. February 2, 2019 at 12:45 AM · Rotate the first three positions of the firsts and the same for the seconds (but not crossing sections). Then rotate the rest, even crossing sections. February 2, 2019 at 12:49 AM · (Cont.) there’s a lot more than just technical/musical ability that goes into leadership. To ignore what it takes to be an effective and inspirational leader, both skills- and personality-wise, is foolish and self-defeating, and will reflect on every performance and upon the dynamics between players and ensemble cohesion. I’m talking professional orchestra level, not 4th Grade. February 2, 2019 at 03:47 AM · The advantage of the principal second and the concertmaster trading off is that if the concertmaster has the Vesuvian flu on the night when you're doing Scheherezade, the Principal Second can slide over and play the E harmonics. February 2, 2019 at 04:16 AM · "Rotate the first three positions of the firsts and the same for the seconds (but not crossing sections). Then rotate the rest, even crossing sections." Possibly especially useful for university or youth orchestras because of their educational goals. Both of the university orchestras in my area, the last time I heard them, had two or three section leaders in each section who rotated with each piece during the concert. I've played in another university/community orchestra that had two concertmasters who alternated concerts. February 2, 2019 at 07:47 AM · Really needs the obvious thir option: a mix of rotating and fixed seating. I’ve never seen a violin section where everyone rotates, but there are many where a few players are fixed and the rest rotate. February 2, 2019 at 11:36 AM · I've played in both. In one orchestra, we moved desk by desk up through the seconds, then to the back of the firsts, and up through them. The front desk of seconds, and the front two desks of firsts were outside this system. In another orchestra, we had fixed positions, and had a very good rapport with people round us. In particular, my desk partner and I made a very good team, where we complemented each other. I think my confidence boosted my partner, and she curbed my worst excesses. So, rather open-minded on this. You need a big orchestra (in numbers) for rotation to work. February 2, 2019 at 11:42 AM · Paul, if you're doing Sheherezade as number two, you practice the solos "just in case" and are relieved when your leader makes it safely to their position. February 2, 2019 at 01:19 PM · Malcolm I'm not surprised, that sounds like a good safety. For amateurs, at least, there's a world of difference between practicing solos in your room and playing them with the orchestra. I'd expect pros to be able to manage that pretty smoothly though. February 2, 2019 at 06:35 PM · In my community orchestra, seating is fixed for one “season” and everyone has to audition again for seating, which is one kind of rotation. February 2, 2019 at 07:35 PM · I've yet to play in a professional orchestra with fixed seating. With the exception of section principals, I've always rotated within or between the violin sections. As I tell my students when they stress about seating auditions and placements, I've sat everywhere from concertmaster to last chair viola...unless I was a principal player, they paycheck is the same, and always fun! February 2, 2019 at 11:34 PM · I live in San Antonio, Tx and both the symphony and my University (UTSA) use rotating seating between sections. In the SAS, the principles stay, in univeristy, we rotate. Right now I am principal second but I have sat concertmaster. It just depends on the concert. It's a really great experience so we learn excerpts from both sections. February 3, 2019 at 04:13 AM · In run-of-the-mill amateur orchestras it is a good idea to have one of the best players in the middle of the back of the string sections to help hold the surrounding players together. Did that in my last years in my last orchestra. It works, no doubt about it. some of the 2nd violin excerpts you undoubtedly learn are learned because the 2nds have the hard passages (Brahms 1st piano concerto, for example, or some of the Mozart operas). You only see them on 2nd violin audition lists, though. You probably won’t see an audition excerpt list ask for the 2nd violin part to Don Juan, though. I remember Andor Toth (NBC Symphony under Toscanini, Cleveland Orchestra Assoc. CM under Szell) talking in rehearsal at Stanford about the importance of playing as if the “concertmaster of the 5th stand” — something I didn’t quite grasp at the time, but now it seems quite obvious. The younger, status-conscious players sometimes have a hard time realizing that it is sometimes recognition of their ability that put them there, not a lack thereof. February 3, 2019 at 09:53 PM · To clarify, the San Antonio Symphony uses a *voluntary* rotation between sections--colleagues can opt in or out each season; those who do not opt in will rotate only within the section for which they are contracted. Those opting in will still play in their own section most of the time. Within each section there is full rotation with the exception of titled players. However there is no differentiation in pay between section 1st and section 2nd players; all are equal. In my summer job in Boulder, the Colorado Music Festival does indeed utilize full rotation between as well as within sections, again with the exception of the titled players. Second violin auditions might include 2nd violin parts to the Magic Flute overture, Rachmaninoff Symphony #2, Brahms 1st piano concerto, along with the usual standard 1st violin parts. My personal favorite second violin parts are Mahler Symphony #9, which is spectacular; other Mahler symphonies; Bartok Concerto for Orchestra; Beethoven symphonies with the exception of #6; Brahms and Prokofiev symphonies. Any responsible associate concertmaster will learn the big solos for each concert (Scheherezade, etc) just in case. It is really stupid and irresponsible to be unprepared when one is only a case of food poisoning away from being put on the spot. And finally, is there any way to see the voting results without voting (again)? Edit: Never mind. I think my computer decided to act up. February 8, 2019 at 01:09 AM · I think every section in the Orpheus Chamber Orchestra (New York) rotates -- principals and all. They also play without a conductor!